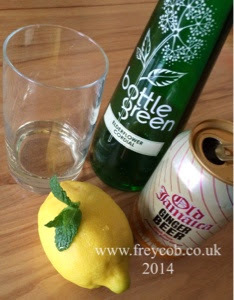 The quickest, most refreshing drink, served cold but with the heat of non alcoholic ginger beer. 1. Add a splash of elderflower cordial to your glass. 2. Squeeze in some lemon juice. 3. Gently rub the fresh mint to bruise it & release the mint oil. Throw this into your glass. 4. Top up with ginger beer. 5. Enjoy the perfect drink on a hot day! Can be served over ice, or alternatively chill everything beforehand.